In the construction of the curves showing the motions up to the time of unlocking (fig. 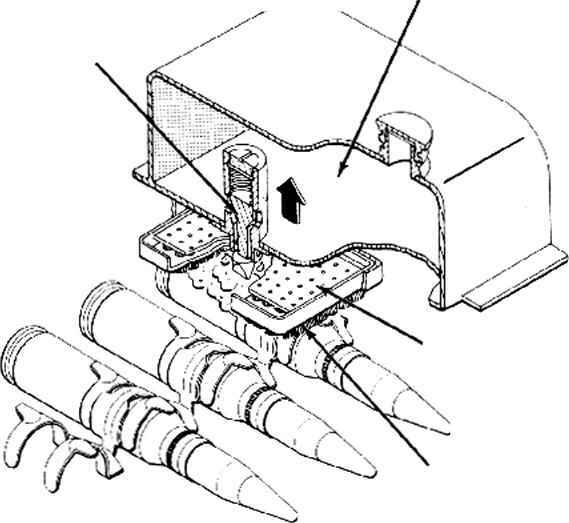 3-27) it was shown that the gun is fired during counter-recoil when it is still 0.0207 foot from its most forward position. As shown in fig. 3-34, the gun is 0.0805 foot from the firing position when the bolt locks to the barrel. Therefore the remaining travel to the firing position is .085 —.0207=.0643 foot. Since the velocity of the gun is 6.7 feet per second at this instant, the time required for the gun to travel 0.0643 foot would be approximately 0.009 second. This time is actually too long for efficient operation, since the locking action can be completed and the effects of the shock of locking can settle out easily within 0.002 or 0.003 second. For this reason, the gun should be fired at least by 0.050 second as shown in fig. 3-34. However, at 0.050 second the gun will not have rcachcd the 0.0207-foot displacement shown in fig. 3-27. This situation arises because it was necessary at the outset of this analysis to estimate the required barrel spring characteristics before sufficient data were available to determine the timing accurately or to take into account such detailed factors as the effect of the impact of the returning bolt. The discrepancy resulting from the fact that the estimate was not exact is slight and for present purposes, the curves shown in fig. 3-34 show good enough agreement to be used for preliminary design purposes. In an actual design problem, better agreement could be attained by recomputing the curves for a slightly stronger barrel spring. Having the data shown in fig. 3-34, a better estimate can be made of the factors controlling the required strength of the spring.